Rich Miller, in the Daily Southtown writes that Tom Cross has a big lead in the Illinois Treasurer's race after kicking off his campaign late in Q3 of this year. Miller posted about a poll he took in the past few weeks. Meanwhile, former Illinois House Republican Leader Tom Cross is leading DuPage County Auditor Bob Grogan for state treasurer 29-18, in that same Capitol Fax/We Ask America poll of Republican primary voters. But 54 percent remain undecided, about the same as in June, when the firm found that 56 percent were unsure of their choice. Cross’ people have to be somewhat relieved by these numbers. They’re polling higher than any Republican gubernatorial candidate just days after Cross received a ton of press for voting for a gay marriage bill. Tom Cross polling HIGHER than any Republican Governor's candidate is the biggest news here. Bill Brady tops out at 25% and he's been on the ballot statewide in both the previous primary and general election where he lost out to Governor Pat Quinn. Cross has NEVER been on a ballot statewide. Really speaks to all the work he's done over the last decade supporting candidates up and down the ballot all across Illinois. He's stood with incumbents and challengers for State House in all four corners of Illinois. They're going to be standing with him and have built a strong base of support heading into the holidays. The Cross campaign is also going up with media. We've covered his campaign's first radio buy, which featured a 60 second spot. You can hear the Tom Cross for Treasurer radio commercial here. 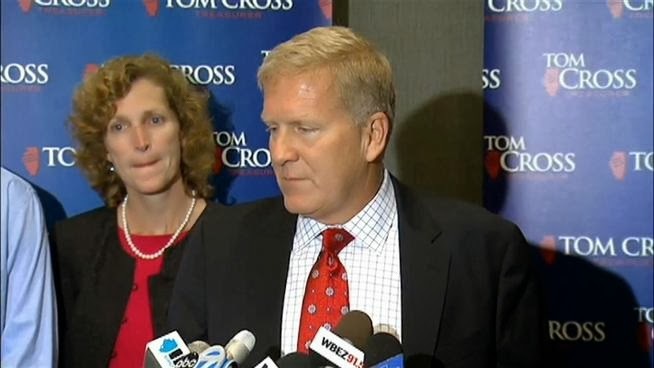 You can find out more about Tom Cross and his campaign for Illinois Treasurer at www.jointomcross.com.